100 mins. Rated R for bloody violence, disturbing images, language and some sexual content. Many people know the love I have for the novel Carrie. There have been three adaptations of the classic novel (the original film even had a sequel), most recently in 2013, directed by Kimberly Peirce (Boys Don’t Cry, Stop-Loss). That’s the one we are talking about today. Carrie White (Chloe Grace Moretz, Let Me In, November Criminals) is a troubled girl with a difficult life at home. Her mother Margaret (Julianne Moore, The Hours, Kingsman: The Golden Circle) is a religious fanatic who believes the very birth of her daughter to be one of the most sinful acts in her life. At school, Carrie is not popular. When she experiences her first period, she is tortured and ridiculed by her female classmates, led by Chris Hargensen (Portia Doubleday, Youth in Revolt, TV’s Mr. Robot). Many of the girls later feel terrible about their actions, including Sue Snell (Gabriella Wilde, The Three Musketeers, TV’s Poldark), who devises a plan to make things right with Carrie. Chris, though, devises a plan of her own, that will push Carrie to the breaking point. What the girls don’t know is that Carrie White has an amazing gift, one that she cannot control. This gift has incredible and horrifying potential that will forever alter all their lives. This is a film that brings to life a classic argument among film criticism. 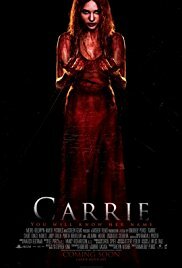 The crew, including director Peirce, claim that this incarnation of Carrie is a re-imaging of the classic Stephen King novel. Unfortunately, this film is very little more than a scene-by-scene remake of the original film. It even uses the original screenplay by Lawrence D. Cohen with added updates and a few tweaks by Riverdale creator Robert Aguirre-Sacasa. It just feels hollowly made. It’s difficult to blame the studio for interfering (the film was notoriously heavily re-edited after poor test screenings, cutting somewhere around 45 minutes from the finished product) because of just how much the movie feels like a retread of the original. Moretz and Moore are terrifically cast as daughter and mother White. Peirce fills the rest of her cast with the hottest young stars of 2013, including Ansel Elgort in his first film roll as Tommy Ross, Sue Snell’s boyfriend. Elgort does a pretty nice job as Ross as well. The film is well shot and features some truly impressive camerawork. What muddles the final product is the atrocious CGI (it didn’t look very good in 2013 either). Some of it is truly cheap-looking. The movie didn’t need some of the more stylish CGI, so I don’t understand the need to use it, especially in the last third of the film. Carrie is fine, but it beckons to be compared to Brian De Palma’s superior film from decades back. It features some fine performance work but there are some technical issues with marr the film’s watchability. It’s too bad, because there are shades of incredible here, but it just feels too similar, and in that way, unnecessary.